We were (hopefully) inspired to take up the mantle of our civic duties by Superior Court Judge The Honorable Cynthia Ludvigsen. Along with a pop quiz to test our knowledge, Judge Ludvigsen undoubtedly convinced us all that our jury avoidance tactics are not worth the toll they take on our justice system. Also, Mr. 4th of July himself, BILL MCCALMON, presented us with a generous donation in recognition of our logistical support during the Independence Day festivities. Finally, we were able to celebrate the triumphant return of one of our best and brightest, SCOTT SHOWLER, who will again be gracing our club with his regular presence. Our San Bernardino County Sheriff, John McMahon, is addressing the club with updates on county safety, Sheriff’s Department programs, and how we can get involved to support our county’s finest. The distinguished president of our very own California State University, San Bernardino, Tomas Morales, will be paying our club a visit to update us on the latest and greatest news from CSUSB. This week, the Redlands Bowl will be bringing the house down during their regularly scheduled Friday and Tuesday shows. Tomorrow night, July 21st, the classics will get an unexpected twist with Sgt. Pepper’s Lonely Bluegrass Band. The wildly popular ensemble puts a twangy twist on some of the Beatles’ biggest hits! And Tuesday evening, July 25th, get a jump on the crowds by watching the dress rehearsal of this summer’s feature musical, Tarzan! 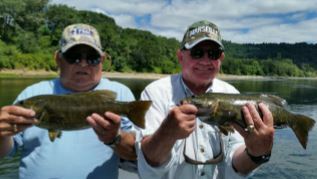 If you want to hear a fish story, be sure to ask RON JEFFREY, who reportedly caught 381 small mouth bass in two days on a trip to Oregon earlier this month. Rotarians KEVIN CORREIA, BILL HATFIELD, DON MCCUE, and LARRY BURGESS were spotted Monday night paying homage to downtown Redlands mainstay Citrograph Printing at their anniversary celebration. My sources report everyone was on their best behavior. Well it is continuing to be a warm summer, I hope many of you are spending time in the shade, beach, or out of town in a much cooler environment. The only member I know who will be in town, because it is his high season, is JEFF FRAZIER. We are so lucky to have JEFF and our local fire department protecting our homes and property in this dry region. For this week, I thought I would mention the importance of Rotaract. We all understand the significance of youth in our society and to the sustainability of our club. It appears that Rotary international understands this too. 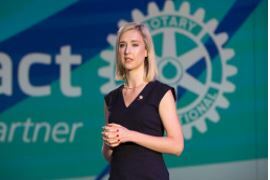 In fact, they felt it was so important, that they devoted one morning session to a young lady by the name of Brittany Arthur (seen below) who is president of her Rotaract club in Berlin. Of course, she told us her story, but it was a fascinating one. She was raised in Australia and received a Rotary scholarship for study in Japan. While there learning the language in 2005 the earthquake hit followed by the tsunami that put her studies on standby. Well, her sponsor told her that if she could learn Japanese, she could learn German. So, they shipped her off to Berlin to continue her studies. While there, she learned the language and became involved in Rotaract. Today she is president of her Rotaract club in Berlin. Brittany told us that our youth have the same concerns and passions as their parents, but that they just view and express life more electronically that we do. It is important to keep in mind that their expression of service may be limited to actions rather than financial commitments as they are beginning to make their way forward in the world. But, if we can keep them engaged in Rotary, we will have our next group of leaders ready to take our place. This brings home the importance of the work we do in our community. As we continue to keep our local youth involved in community service and Rotary, we will have our next member ready to join. I appreciate all of those who work with Rotaract and other youth services, you are building the foundation upon which our club will grow.